The flower gardens are a fantastic decorative element since the variety of their colors and shapes, provide an incredible visual aesthetic. Beyond its beauty, flowers have a unique aroma that transports you to a place of pleasure and rejoicing. From the smell, you can achieve a sense of peace and tranquility. After a long day at work, who does not want to have a place like that in their house? 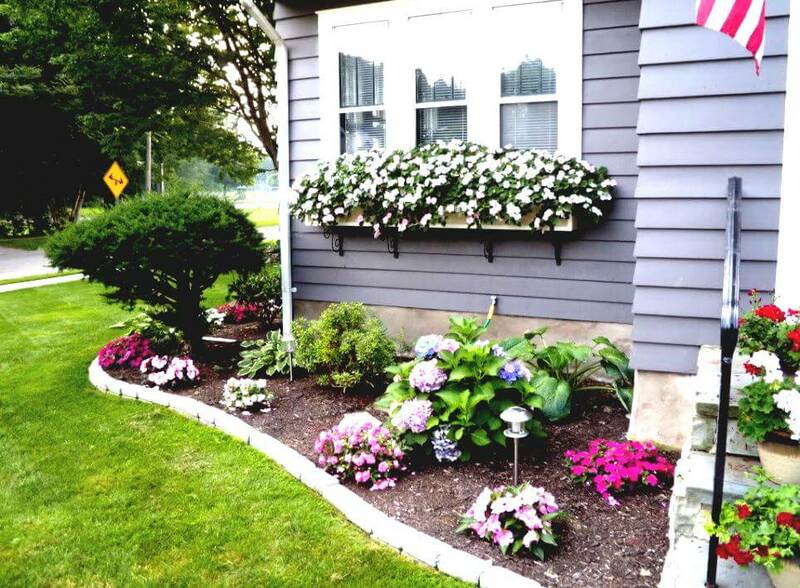 You will enjoy decorating your garden with flowers because you will keep your mind occupied in a pleasant task, which is extremely important to disconnect from daily responsibilities. Added to this great benefit, you will remain physically active while caring for and maintaining the plants. We will give you some great ideas about gardens with flowers that you will love. With them, you can take some tips and have a charming corner like the ones we will show. If you want to have a place full of flowers, it is not necessary to have a huge patio or garden. You just have to look for a space with natural light and get to work! Whether the terrace or patio is grass, wood or material, it is a good idea to define the sector where flowers are going to be placed with stones. The visual image changes completely as it causes the two spaces to be divided. They can be large or small stones. It can be a wooden cart or metal, both are perfect to place them in the center of a garden with colorful flowers. You can find these elements of different sizes; The biggest ones are the best since they allow you to vary the flowers type and give more space and vividness to your space. A wooden barrel creates a great color contrast with the flowers. In it, you can make a small garden since its dimensions usually allow it. We recommend you to combine flowers of various colors with stones and small ornaments that recreate some dreamy decoration. Use small water fountains, bridges, stone paths and everything your imagination dictates. This idea is extremely original. If you find an old wooden staircase, you can place it supported on a wall and on each step put pots with flowers of different sizes and colors. Another way to decorate it is to entangle different branches in some nails. It is extremely simple and aesthetically beautiful. If you can find a large and hollow tree trunk, do not hesitate to place it in the center or in a corner of the garden. With the help of a handsaw, shape and enlarge the hole, place dirt and fill it with colorful flowers. The wood will surely resist moisture perfectly. The contrast of the flowers, with the green of the plants, will create a fantastic atmosphere. If you want to give it a brighter touch that lasts longer, you must give it a coat of varnish before placing the soil. The brightness that the bark will take will create a greater contrast with the flowers and vegetation that will draw visual attention to it. An innovative and very creative idea is the vertical gardens. It is about using one or more walls of a gallery to fill your gardens with flowers. You can also use vines with flowers that completely cover a certain sector. Another tip is to place different types of pots at different levels throughout the wall and with different types of flowers. Although they are also beautiful when colors are unified and everything is the same tone and color. Glass jars with a rustic string on the neck, tied to a nail on the wall. Recycled green wood boxes. They can be painted or not, that is in everyone’s taste. You can put pots of different sizes inside each drawer, placed as a shelf. Place rectangular wooden planters directly at different levels. You can also recycle plastic bottles as pots and place them with nails at different heights along the wall. With simple ideas, you can transform a place and change it completely with flowers. You will feel much better doing it and then, enjoying every moment in beautiful gardens with flowers made with your own hands.